A few weeks ago I heard the new single by Creed. 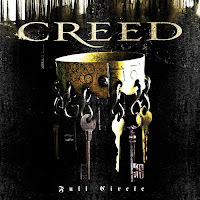 Back in the 90’s I was a HUGE Creed fan–you know, back when they were cool for a minute or so. “My Own Prison” was practically my anthem in high school. Scott Stapp’s grim vocals gave my hormonal upper-middle class teenage angst some reprieve. Of course they had a few other catchy little numbers like One, Higher, My Sacrifice, With Arms Wide Open, and One Last Breath, but after a few albums they disbanded in 2004. Because of my history with Creed back in high school, I felt like I really should give their new single a shot when it popped on the radio one day. So with unabashed optimism I listened…and I loved it. My excitement led me to admit this new found discovery and renewed admiration to a co-worker of mine, the response was–and I quote–“I am ashamed to know you.” Because of that favorable response I was a little hesitant to actually buy the album. After listening to “Rain” a dozen times or so, and becoming more and more hooked after each listen, I broke down and bought it. What are my thoughts? Well, Rain is great. Scott Stapp’s vocals are as strong as ever, the overall sound is a little more refined and upbeat, the chorus is extremely catchy, and the message is uplifting–what’s not to love? Maybe I’m just a sucker for songs about Rain. Travis’ Why Does is Always Rain on Me? has been a longtime favorite along with No Rain by Blind Melon, Rain King by the Counting Crows, and of course the classic Raindrops Keep Falling On My Head by B.J. Thomas. I don’t think that was the case however, as I was pleasantly surprised by the album overall. Creed seems to have returned after their hiatus to resume making music as though the break had never happened. If anything, their sound might be a little more refined after their time apart. I guess I’ll resume my status as a fan of Creed, I just may not admit to it to any more of my friends for awhile.